Ideal for simultaneous lock-out of multiple valves and circuit breakers. Device can be locked using four padlocks. Can be adjusted once the cable is locked. Grease and dirt resistant polyester laminate. Can be customised with name, department, planned task, etc. FREE DELIVERY ON ORDERS OVER €100! 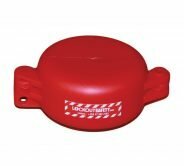 LockoutSafety.com, a division of Powerpoint Engineering Limited, offers you a ‘one stop shop’ when it comes to all your Lockout Tagout needs. 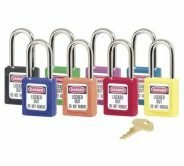 With an ever increasing obligation on employers to safeguard the safety of their employees, we hope that our website will give you a good overview of the quality products and services that we can offer you to meet all your Lock out Tag out requirements. 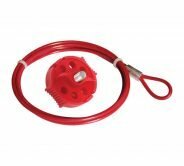 We stock the latest Lockout Tagout safety equipment from leading brands such as Masterlock and Brady. 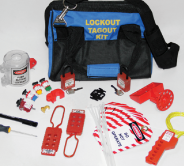 If you are looking for lockout tagout stations, tags, kits & hasps – we have it all. We also offer many different circuit breaker lockout systems to cover a wide variety of customised lockout conditions. Our lockout systems include: breaker switch lockouts, low-profile circuit breaker switch lockouts and more. 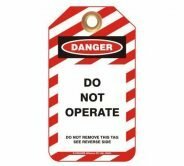 Lockout/Tagout standards and equipment are used to protect employees from hazardous energy sources on machines and equipment during service and maintenance. With ever increasing safety legislation, assuring the safety of workers working on electrical machines and valves is extremely important. A huge number of today’s industrial accidents are caused by the uncontrolled release of energy or by the unexpected start up of machines or equipment. Every workplace requires having an effective energy control program in place, this program should be specific to the types of machines and equipment being maintained. Many Hazardous energy source accidents can be avoided by making sure that proper Lockout/Tagout procedures along with the use of high quality lockout tagout equipment is used. To perform service or maintenance work on industrial equipment safely, it is imperative that the workers undertaking the task fully understand the importance of energy control and know how to apply energy isolation and Lockout Tagout correctly. Lock out Tag out Audits should be run regularly. Equipment Identification and Cataloguing, Energy Control Tags and Lockout Tagout Signage should also be implemented.